Mod: The following article is front page news in this week's Arcadia Weekly, and it is a pretty good indication of the effect The Tattler is having on election coverage there. I can't imagine the Roger Chandler campaign is quite as excited about all of this freedom of the press as we are, though. Thanks to Terry Miller for bringing it all home. Arcadia Election Mailer Pokes Fun At Opposition As Election Tactics Run The Gamut - At the Eleventh Hour, Humor Has Thrown Some Residents a Curve Ball (Arcadia Weekly link): April’s municipal election in Arcadia has turned ugly and humorous at the same time. This is nothing new in politics, however. While candidates exchange jabs at one another and residents decry the advent of "districting," which leaves over 11,000 residents without a voice, campaign mailers and complaints are flying in to the Fair Political Practices Commission. The Epoch Times, a Chinese language newspaper, is the latest to splash another, potentially illegal, political photo, where an Arcadia police officer’s badge is clearly shown in a direct endorsement for candidates Harbicht and Chandler. Arcadia City Hall is not amused. More recently, Deborah Priester, a resident of District 5, has had enough of the attacks and put out a mailer that encourages voters to select ANYONE but Roger Chandler. 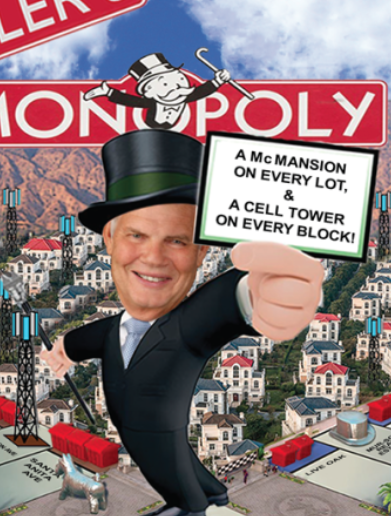 The mailer depicts Roger Chandler as the McMansion Monopoly man. You might remember two weeks ago, ‘Arcadia’ Best’ – a conservative blog run by Mayor Pro Tem Sho Tay – ran the same photo of the APOA endorsing the two pro-development, or ‘property rights,’ candidates for Arcadia’s election next month. They, too, got their wrists slapped by election officials, who do take these matters very seriously. “It seems that the ARPAs are now back for Round 2, but they’re trying a completely different tact as their 2016 graphic masterpieces didn’t get Harbicht elected. April Verlato was successfully voted onto the City Council while Bulldozer Bobby suffered an extremely embarrassing defeat. One that he is still whining about, and blaming everyone but himself ... Now it is 2018, and their chosen target this time is the mild mannered and politically positive Tom Beck, who is currently on the City Council and running for re-election. They are also targeting any candidate that dares to run against the timeless Roger Chandler, who has been sitting on the City Council since back when Fred Flintstone was still in diapers." “What I especially like here is the description of Beck being a mob leader causing crime to increase, property values to decrease and taxpayer money to be wasted, all at his direction. Joyce Platt is apparently a “puppet” of Tom Beck, and Jolly Wu is selfish because she wants to keep the Arcadia Dial A Ride for seniors and the disabled, herself being wheelchair bound. Your only hope, according to this group, is to elect the venerable Bob Harbicht and Roger Chandler." We contacted Tom Beck for comment on this story and the advent of the dueling mailers. "I am most concerned about all of the lies, misstatements, and plays to fear that Harbicht is sending out at me. He said he would run a clean campaign. His ethics certainly are different from mine,” said Tom. Mayor Pro Tem Sho Tay, who is not actually running for office (he was appointed), has allegedly opened a campaign committee and may be receiving contributions from local real estate interests. According to sources familiar with the campaign, Sho Tay is allegedly paying from his committee for the mailers being sent in support of Harbicht and Chandler. However, in an email to this office, Tay denies any responsibility. Mod: A second Arcadia Weekly article from this week's action packed edition deals with an FPPC complaint filed by an annoyed resident. Apparently the FPPC now agrees that this Arcadia resident does have a valid complaint, and has launched an investigation of ARPA. 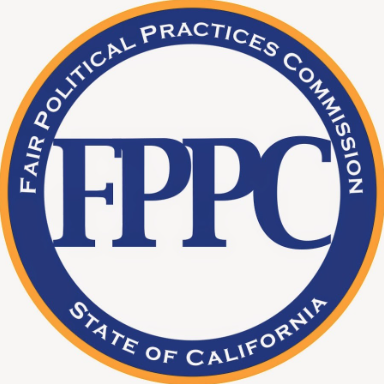 Arcadia Resident Files FPPC Complaint Against PAC (Arcadia Weekly link): A 35-year Arcadia resident, Roger Nemrava, recently filed an FPPC complaint regarding the Arcadian's Rights Protection Association (ARPA): (FPPC complaint COM-03052018-00262: Arcadian's Rights Protection Association.) ARPA, which is not based in Arcadia but Alhambra, has sent out mailers supporting Bob Harbicht and Roger Chandler, candidates for Arcadia City Council, allegedly without the required disclaimers. Not a good thing to do. The first mailer sent was in support of Bob Harbicht. Nemrava complained to the Arcadia's City Clerk's office. The Chief Deputy City Clerk for Elections, Lisa Mussenden, contacted ARPA to stop. Shortly thereafter, another mailer from ARPA was mailed in support of Roger Chandler. Again, Nemrava complained to the Arcadia City Clerk's office, and then decided to file a complaint with the FPPC. The Arcadia Rights Protection Association is being investigated by the FPPC for violating campaign finance disclosure laws. “ARPA doesn’t comply because it is attempting to hide where the money is coming from for the mailers. This is a major violation,” Nemrava told Arcadia Weekly. Nemrava belives ARPA, Harbicht and Chandler are breaking the rules. Mod: Bulldozer Bob and the Artful Roger continue to run absurdly dirty campaigns, while their alleged financial bagman, peacock proud Arcadia Mayor Pro Tem Sho Tay, denies knowledge of any of it. Something everyone should find completely laughable. This week's Arcadia Weekly is a collector's edition. People will talk about this one for years. Have the confused Chandler devotees woken up to reality yet ? I used his latest mailer to start a fire last night in my fire place, didn’t work to well.......just like him. I used mine for a cat box scoop. Did the turds stick more than typical plastic scoop? It doesn't really matter. You just throw the whole thing away. Several of my friends telling me that people passing out Roger's flyers door to door all driving fancy cars (BMW, Mercedes...). One just told me tonight that the person without asking put a sign at his parent's front yard. I told him to remove it since the yard sign was put in without permission. However, he told me that he is wondering people who driving very expensive cars pass out the flyers for Roger, what kind of benefit they might get after Roger gets his way into the city council? Probably Realtors. They make a lot of money off of vanity castles. Has he hired Stormy Daniels yet? CHANDLER VIOLATED MY PROPERTY RIGHTS! WE DON'T SUPPORT CHANDLER! THIS SIGN IS ILLEGALLY PUT ON MY YARD WITHOUT PERMISSION FROM A CANDIDATE THAT SUPPORTS PROVATE PROPERTY RIGHTS! Good for Nemrava! Nemrava for City Council in District 5! Tay is denying any responsibility for mailers he sent out? I’m confused. It is known as the "Alhambra Confidential." The City of Industry shuffle. Postcard mailers came out a week ago with the heading: LOWER OUR CRIME RATE! On the postcard, Tay's headshort photo is on the upper left corner and Chandler's headshort photo is on the lower right corner. It has Tay's endorsement asking voters to elect Harbicht and reelect Chandler. So how can Tay deny any responsibility? It sounds like it’s all on him. Did he out right lie to the Arcadia Weekly? Usually you can tell Sho Boat is lying when you see his teeth. Most likely a clever fox Tay will not admit he lied to the press. He would pull out the I misspoke or the reporter misquoted me card. This whole thing is turning into a circus that frankly, I don't have the energy for! Can't keeep up with anyone so I assume everyone is a scheister (sp?). You need to get your information from more than just this one source. My family’s favorite game is Chandopoly. I’m always the peacock. My children fight over who gets to be the coyote. My neighbor comes over and plays the Mercedes. No one wants to be the thimble. Has the Arcadia Council voted for restoring the land where the 100-1 Club sat into Parkland Green Space? The smoke from a burning fireplace, in rainy weather sits down low and filters into your neighborhood, causing irritation for the sinus. Don't judge, least ye be judged. Years ago a young woman driving a Mercedes used to pull her car over to the curb in front of homes and collect plastic and glass bottles from the trash bins on trash day. Did she get permission to do that? Maybe there is a City permit. Aren't plastic,glass bottles, soda cans, among others, dumped to the blue-color recycle bins and collected by the City's contracted waste management company? I have seen people stealing bottles and cans from the recycle bins parked outside the neighbors' homes on trash collection day, but they don't usually drive fancy cars. 8:47am. Why should Athens receive all the glory? Why not? They take all the garbage. WH News conference: the Senate passed the Spending Bill early this morning, President Trump reports he will sign. As soon as next week, announcing deals with South Korea. President Trump: My duty is to keep America safe. As a matter if National Security "I have signed this Bill"; i am telling Congress now, i will never sign a Bill like this again, this was a omnibus Bill. Congress must get to work and stop bipartisanship. Defense Secretary James Mattis, this is the largest Military spending Bill, we have to protect this Country. Loop Holes from Crongress must be worked on and closed, says Homeland Security Director. President Trump, our depleted Military is being restored. While I am very disappointed with this Bill, we have to have the Worlds strongest Military. We are facing a very different World. The Opioid addiction needs to be addressed, we will be suing certain Drug Companies for what they have done with Opiods. The Republicans have fought to address DACA,Democrats are using DACA recipients for their own purpose, talking points. The President wants line item Bills, and get rid of the Filibuster Rules. It blocks the process, majority rule should apply. Athens receives a fat paycheck for picking up the garbage and they get kick backs on the Green Waste. Why are you against people that do hard and dirty work, just to get by on a few extra dollars that make a difference in their lives? Are you saying that you support corporations over individuals? If so, Athens should supply more jobs for these people that are attempting to better their life. Athens is one of the few non-union trash companies in California. Good for Athens, that shows that they treat their employees well. This is also an indicator that the company can hire more glass and aluminum can collectors. Cities should not write tickets to the lower income individuals who are out working and not looking for handouts. Maybe the Unionized Garbage companies should be taxed for job training for these people. The son of the President of Athens Services sits on the Sierra Madre City Council. He is a big supporter of the municiple employee unions here. Translation: 12:02 hates freedom of assembly and association. He does enjoy, however, magnanimously tossing beverage container redemption change at the unwashed. All Sierra Madre City Council members are big supporters of municipal unions. Why do you think CalPERS was brought into the retirement deal. In the past our heroic first responders would get pension bumps from sitting councilmembers in exchange for campaign endorsements. Didn't happen this year, though. Arcadia is a completely different story. Harbicht and Chandler have whored themselves out in the most flagrant of ways. 1:12pm. Presumably you are speaking about yourself and your out look in life; as i choose to believe that everyone speaks for themselves. You say you believe everyone speaks for themselves but in the same sentence you presume I’m speaking about myself. Think about that for awhile. Then get Copi’s book. The Dow Jones Industrial Average finished down 724 points, or 2.93%, on Thursday as President Trump unveiled fresh tariffs on China. It wasn't much better for the S&P 500, which tanked 2.51%. The Nasdaq Composite tumbled 2.43%. Leading the Dow lower were prominent big-cap names Caterpillar Inc. (CAT) , 3M Co. (MMM) and Boeing Co. (BA) . "If you take away everything we want to buy, you are going to take away the bull -- that's what happened today where there simply weren't enough sectors worth buying, which causes the tsunami of selling you get today," explained TheStreet's founder and Action Alerts Plus portfolio manager Jim Cramer. I love how the conversations on this blog just take off and go in all kinds of directions. So much more interesting than the handful of stuffed shirts on Arcadia's Best. SB 827 & 828 are nit supported by lawmakers in Sacramento. The Bills were said to be disproportionate to communities of color. And Copies book deals with humans whom attempt to translate other human thoughts into their own projections of subjects? I don’t know who “Copies” is, but as soon as someone automatically blurts pop-psychology buzzwords like “projection,” all I can say is turn off the daytime TV. I have reported you to Dr. Phil. D...do...do you think he can help me? Was that a song lyric? Anyone go to the Sierra Madre candidate’s forum yesterday? I hear they had soda. 1:32pm. If you understood the Stick Market then you would have realized that the Market immediately rose up in all values the day Donald J. Trump took office. No loss on the gains! What is the price of sticks these days? I have a yard full of them and I am thinking of selling. The Stick Market sounds like something I'd like to invest in! Especially since Trump has turned the Stock Market into a roller coaster. If you burn some of them, the rest will increase in value. It’s pretty bad that on election night Arcadia will once again televise the counting of ballots and display the totals in real time. When candidate Chandler sees he is behind, Tay will get the idiots to get the ballots to the post office. They know who hasn’t mailed in their ballots DAILY, city provides the list. This is supposedly the scam that Tay took in 2016 to get elected. 3:04 doesn’t seem to understand economics, stick or otherwise. “The Obama administration implemented a number of important fiscal measures, notably the American Recovery and Reinvestment Act of 2009. It also provided strong moral support for the Fed (including the reappointment of Ben Bernanke, who had been President Bush’s nominee). The administration also restored the financial sector faster than expected and carried out a highly successful rescue of the car industry. Too bad that the successor, who takes credit for Obama’s rescue of the economy, appears to be presiding over the beginnings of its destruction. I received another pathetic mailer today from Loser Chandler. He has the nerve to even mention Form 460 in criticizing Joyce Platt and apparently she has a large financial contribution from District 2. She’s running in Distrct 5. First, you really want to bring up Form 460 Roger ? Have you looked at yours lately ? The form shows the proof you’re bought off by developers. Every damn time you run. The mailer backfired !!! I’m impressed Mrs. Platt can pull in donations from other districts. Wow!! She’s got my vote. On the same mailer, another smear and outright lie about Jolly Wu's position on HOA. Jolly Wu has never said that she wants HOA in District 5 and that is why she lives in a non-HOA district. It also said that no one publicly funded her campaign. This is true because she runs a fully self-funded campaign where she does not want outside influence from individuals and self interest groups. She will owe no one nor any self interest groups. Can Roger Chandler say that? That is why I and others will vote for Jolly Wu. We encourage others to vote for her and bring integrity back to the Arcadia City Council. Arcadians deserve a new leader who really cares about the neighbors and community. Agree! We will Vote for Jolly Wu to be the District 5 City Council Seat. We strongly encourage others to vote for her. JOLLY WU all the way. She owes allegiance to NO POLITICAL GROUPS or INDIVIDUALS. Platt cannot say that. We're voting for Jolly Wu because she is super intelligent, a fast study and is not indebted to anyone. Who dat who say ‘who dat’ when I say ‘who dat’? District 5 residents: make sure you talk to your neighbors. Get them to vote for Joyce Platt. 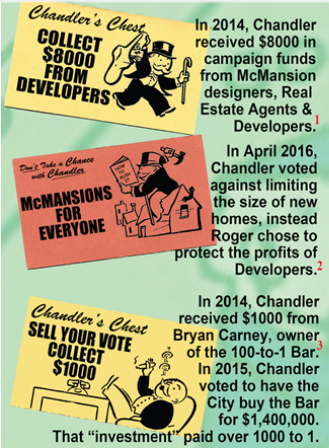 If you don’t do this and Chandler wins, you only have yourself to blame when the monster McMansion goes up next to you, taking away your privacy and views, causing your property value to go down. It’s up to you. The future of Arcadia is in your hands. Anyone have Chandlers Form 460 ? Like to see how much Mur Sol, Million Dollar Construction and Tipping Development have paid him off this time. Plus all the Arcadia cops that will soon get new massive raises thanks to the old fool. 8:27, you can get that by going into your city hall and asking for it. The candidates had to declare any donations over $100 on March 1, and then will have to do it again on April 1. Interesting reading. Self funded candidate Jolly Wu is a better pick for City Council than Platt. She doesn't take money from interest groups, is going into the race unbiased and objective. Her critical thinking skills are very keen and she'll tackle all the issues fairly, unbiased and won't owe anyone allegiance because they contributed to her campaign, something her competitors cannot say. Now Chandler is robo calling our homes !!! Terrible audio recording, likely used 1970 recording device. Sounds like blubbering drunk. I got his home number and going to call him back tonight at 2:00 A.M. I like it--drunk political dialing! How about jaw grinding housing authority chief police talking? There hasn't been anything new on Arcadia's Worst since March 10. Are they having morale problems there?